The planets discovered are similar in size to Earth and are temperate, according to NASA astronomers who spoke at a press conference this afternoon. The exoplanets orbit a star called TRAPPIST-1, which is named after the telescope located in Chile used to find the seven planets. The star and the exoplanets are only about 40 light years or 235 trillion miles away from Earth. Why this matters: These seven planets could potentially host life since they have equilibrium temperatures low enough to have liquid water on their surfaces. Three of them (TRAPPIST-1e, f, and g) are within the habitable zone of the star, and these three may even have oceans. This is the first opportunity to search for signs of biological life outside of the solar system, according to the NYT. Next up: Finding gases to support life on these exoplanets will be key to upcoming research. The astronomers claim there is a good signal to noise ratio, which means studying the rocky planets' atmospheres will be feasible. The James Webb Telescope will launch next year, which will help with the research, along with the Hubble Space Telescope. 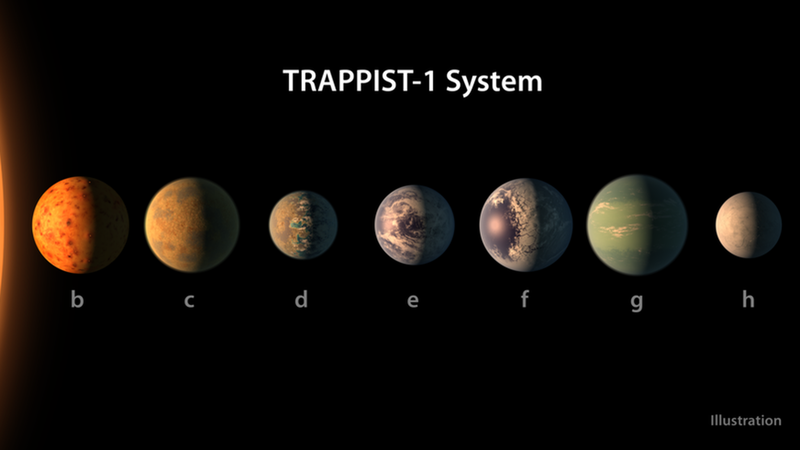 Top candidate: Although TRAPPIST-1f is a bit cooler than Earth, if it has the right atmosphere and enough greenhouse gases the researchers expect it to be the most likely candidate to support life, according to CNN's report. The star would appear three times as big as the sun in our sky on TRAPPIST-1f, and everything would likely be tinged with a salmon-colored light.